The Swiss National Bank maintained the target range for the 3-month Libor between -1.25% and -0.25% and the interest rate on sight deposits was unchanged at -0.75%. Moreover, the SNB reiterated its willingness to intervene if needed in foreign exchange markets to prevent an appreciation of the Swiss franc. The central bank still believes the franc is “highly valued”. It insisted on the appreciation of the franc over the past three months and believes the situation on the foreign exchange market is still fragile. 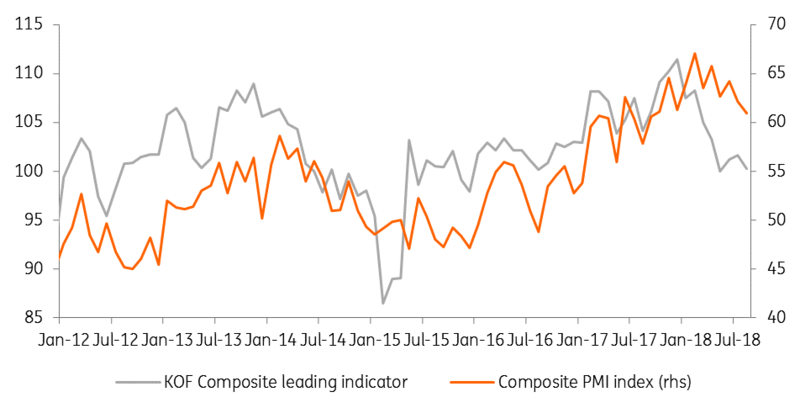 The SNB is in a tricky situation with some very strong growth indicators but it also has concerns about the global external environment which could impact the domestic market and CHF valuation. On the positive side, the Swiss economy grew at a fast pace in 1H18 as GDP growth reached 1% and 0.7% quarter on quarter in the first and the second quarter thanks to robust foreign demand and favourable evolution of the Swiss franc. The Swiss economy is on a fast track since it has been recording an above 0.7% QoQ growth rate for the fifth quarter in a row. This hadn't been the case since the beginning of 2015 when the exchange rate floor against the euro was abolished. However, 0.2pp of this growth is somewhat artificial and due to license income generated by the marketing of major international sporting events as many international sports associations are based in Switzerland. The SNB also insisted on the improved utilisation of production capacity and the continuous decline of the unemployment rate over recent months. It believes that “economic signals for the coming months remain favourable”. Although the situation is really favourable for the Swiss economy, the central bank remained very cautious. According to the SNB, “the risks to the positive baseline scenario are more to the downside”. We share the central bank's view on the increased risks and we believe that such growth levels are no longer to be expected in the months ahead. The problems don't come from the domestic economy but more from the international context, which has deteriorated sharply in recent months. Indeed, the concern around emerging markets, the Italian budget and uncertainties surrounding Brexit pushed the franc; a currency considered a safe-haven, to appreciate strongly against the euro. 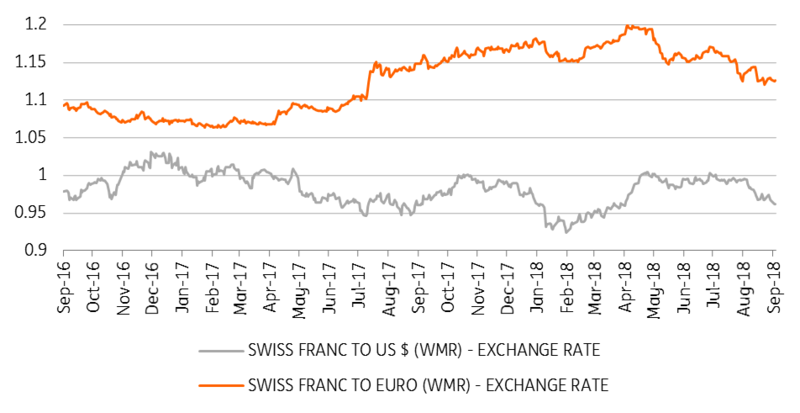 On average, the value of the Euro/Swiss franc rate amounted to 1.12 during the third quarter, compared to the average of 1.15 in the second quarter and 1.17 in the first. And despite the recent appreciation of the dollar against the euro, the Swiss franc also appreciated against the dollar. The Swiss economy is a small, open economy that relies heavily on international trade for growth and the appreciation of the franc may, therefore, reduce the growth momentum in the coming months, which is what leading surveys and indicators are already anticipating. It seems this is what the SNB has taken into account in its monetary policy decision, i.e. “some loss of momentum is expected, due to a slight slowdown in global growth and the dampening effect of recent Swiss franc appreciation”. The SNB has revised its conditional inflation forecast downwards (i.e., if monetary policy remains the same) for 2019 and 2020, signalling a dovish stance. For 2019, the SNB forecasts inflation at 0.8% (against 0.9% anticipated at the June meeting). For 2020, inflation would reach 1.2% according to the SNB, against 1.6% expected in June for 2020 and 1.9% expected in March. This downward revision of forecasts signals that monetary policy will remain very accommodative in the coming years and much longer than previously expected. Given the importance of the value of the franc for the SNB, it's likely that the Bank will continue its very patient policy in the future. We don’t expect any hikes before the ECB starts to do the same. Given the ECB isn't expected to hike before the end of the summer of 2019, we think the SNB won’t hike interest rates before December 2019. Moreover, given the increased risks context expected for next year, it's even possible that the first rate increase will be postponed towards 2020.